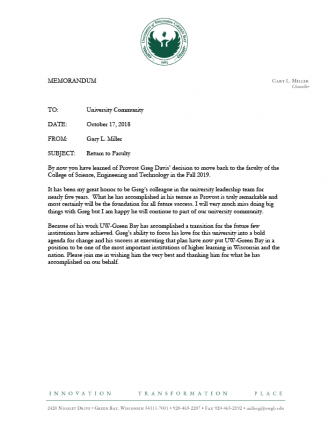 News and Notes | News, announcements, remarks and correspondence from the office of Chancellor Gary L. Miller. 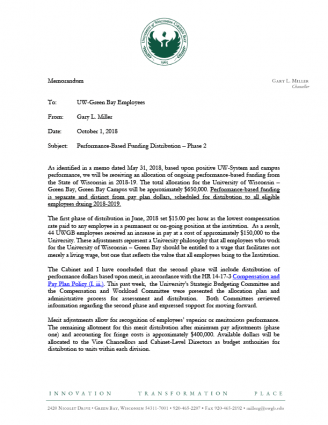 The UW-Green Bay Office of the Chancellor emailed the following memorandum on Thursday, January 17, 2019 notifying the UW-Green Bay community of the Provost Search and Screen committee charge. 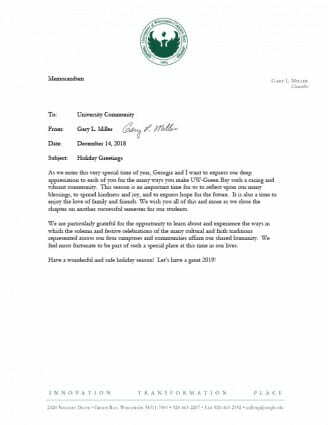 On Tuesday, November 20, 2018, the UW-Green Bay Office of the Chancellor emailed the following holiday greeting from Chancellor and Mrs. Miller to the University community. 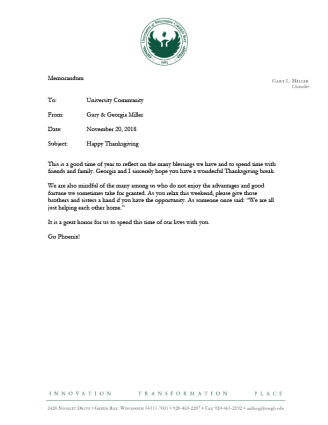 On Tuesday, November 20, 2018, the UW-Green Bay Office of the Chancellor emailed the following Thanksgiving message from Chancellor and Mrs. Miller to the University community. 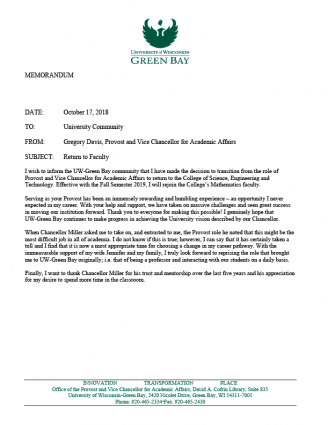 The UW-Green Bay Office of the Chancellor emailed the following memorandum on Wednesday, November 7, 2018 notifying UW-Green Bay employees that the University is initiating a national search for Provost and Vice Chancellor for Academic Affairs. The search will follow institutional policy. 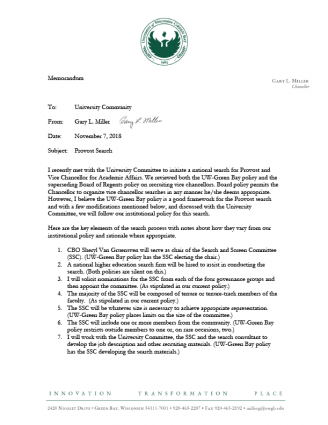 The UW-Green Bay Office of the Chancellor emailed the following message from Chancellor Gary Miller to faculty and staff on Thursday, October 25, 2018. On Monday, October 29, you will be receiving two emails that I hope will excite you. One email will arrive in your inbox from UW-Green Bay Advancement inviting you to help us do more of the great things we are doing for students and our learning environment. Gifts from employees make a meaningful impact on students through scholarships, academic program support, and improving our facilities. The second email will be from University leadership active with our local United Way. For generations United Way has fostered good work in all of our communities and your support is vital to helping those in need who just need a helping hand. Georgia and I support both and we encourage you to consider supporting these programs with an outright, one-time gift or a gift that can be made via payroll deduction. 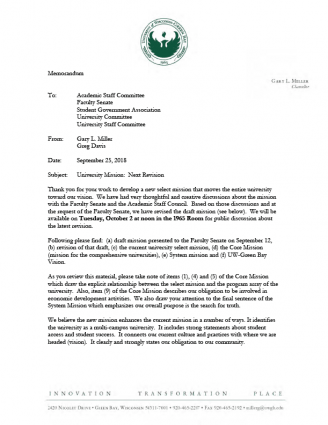 The UW-Green Bay Office of the Chancellor emailed a memorandum from Chancellor Miller and Vice Chancellor for Student Affairs and Campus Climate Eric Arnenson to the University community on Thursday, October 4, 2018. In a continuing effort to create a more inclusive community, UW-Green Bay has adopted a formal land acknowledgment to honor our native peoples. The land acknowledgement was developed by UW-Green Bay First Nations faculty to be incorporated into signature University events. Faculty and staff are encouraged to incorporate the land acknowledgment into syllabi, publications and programs as appropriate. 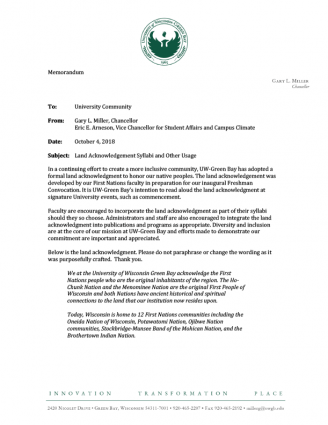 The UW-Green Bay statement of land acknowledgment is as follows. Please do not paraphrase or change the wording as it was purposefully crafted. We at the University of Wisconsin-Green Bay acknowledge the First Nations people who are the original inhabitants of the region. The HoChunk Nation and the Menominee Nation are the original First People of Wisconsin and both Nations have ancient historical and spiritual connections to the land that our institution now resides upon. Today, Wisconsin is home to 12 First Nations communities including the Oneida Nation of Wisconsin, Potawatomi Nation, Ojibwe Nation communities, Stockbridge-Munsee Band of the Mohican Nation, and the Brothertown Indian Nation.